Welcome back to our series on sausage casings! This time, we're going au naturel and discussing the use of natural casings, a diverse family of products that come in beef, sheep and hog varieties. Natural casings are flexible, making them ideal for twist-linked sausages. They're generally easier to stuff than manmade casings, and because they're made up of completely organic materials, they're easier to digest as well. 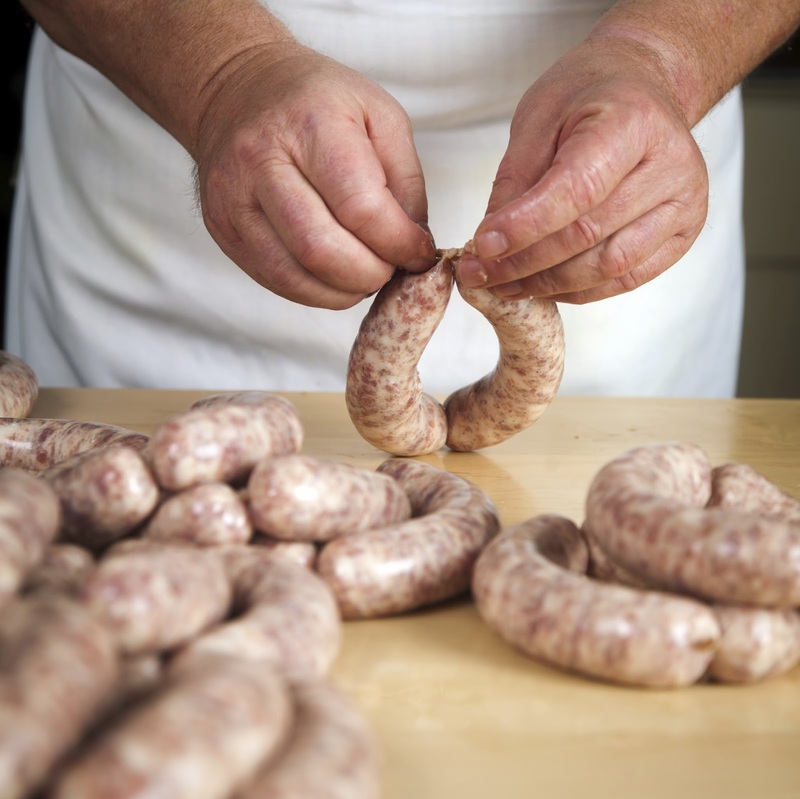 The type of natural casing you use depends on the diameter you're hoping to end up with and, traditionally, the variety of sausage you're preparing. Just make sure to check whether your casing is edible before you eat it! At the Sausage Maker, our natural casings are packed in purified salt and meant to be stored in the refrigerator. This allows for a practically indefinite shelf life, as long as they're kept properly. You'll simply flush and soak your casings in tap water before you use them, and be sure to keep them cool to avoid unpleasant odors! Read on for our tips. How do I prepare a salted hog, sheep or beef casing for stuffing? Unravel the casings into separate strings, setting aside the approximate amount you plan to use. Rinse the salt from the casings with fresh water. When flushing the casings, the inside should be rinsed by opening one end and letting faucet pour in, one end to the other. The outside should also be rinsed. Place casings in a bowl of tepid or lukewarm water with about 1” of one end hanging over the top and soak for 20 minutes to 1 hour prior to stuffing. Some people refrigerate this way overnight. Optional: Prior to stuffing, introduce an ounce of water into the casing before placing it onto the stuffing nozzle. This will lubricate the inner casing wall and prevent it from sticking to the stuffing tube. Slide the casing over the nozzle/tube. During the course of stuffing, always try to keep the casings to the front of the nozzle where the meat is coming out. This helps minimize air pockets and breakage. Why do my natural casings have a strong odor? Salted casings have a very long shelf life when stored properly. When refrigerated and packed liberally in purified salt, shelf life is basically indefinite. Unrefrigerated, these salted casings quickly begin to give off a strong odor even though they are not spoiled. Put them back under refrigeration and this odor for the most part subsides. Can leftover natural casings be reused? If you don't use all of the casings, they can be re-salted and kept in the refrigerator. Squeeze out as much water from the insides as possible and pat dry the outside with paper towel. When fairly dry, sprinkle salt on the casings thoroughly. Do not use iodized salt—purified salt or non-iodized kosher salt is best. However, use your judgment! If mold, rotting smell or texture changes substantially, the casing should be discarded. When in doubt, throw it out. Stay tuned for our next installment, when we'll be covering fibrous casings!